I entered 3 photos into the Alfred East Art Gallery Open Exhibition last year and was lucky enough to have one chosen to be part of the show. Open 14 is upon us, so its now time to decide which ones to enter this year. There is also a local village art show that I want to do in May and then in October along with two other photographers there is the month long exhibition at the Alfred East Gallery to plan for. I've put aside this afternoon to look through my pictures and see what I've got already, and then look at any new ones I might want to try out. The problem is always one of balancing time and finance; getting photos mounted and framed is costly in both effort and money, and all has to be done well in advance - the knack is then to sell something at a price that returns at least what it cost you to produce, let alone make a bit of profit. Tricky, but fun. Talking of enjoyable things ..... last evening was spent with old friends at a pub quiz at The Three Cranes, Cransley. We answered 100 questions and managed to come 6th out of 13 teams. We all have different talents when it comes to knowledge so putting heads together nearly always comes up with some sort of answer - with lots of laughter on the way. Thanks girls for a good night out. 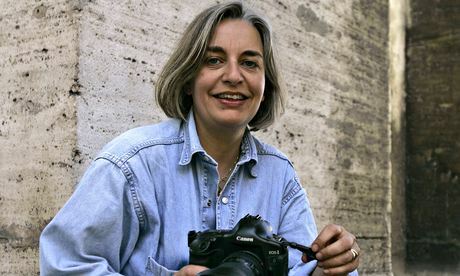 Looking back at the news this week it was sad to hear of the death of Anja Niedringhaus, the German photographer who was shot by an Afghan policeman. She is quoted by the Guardian newspaper when describing conflict as saying 'two sides fighting for territory, for power, for ideologies. And in the middle is the population who is suffering'. How true that is. She'd experienced many conflicts and had become famous for taking photos which helped people realise what was going on at some of the world's 'darkest' moments. So its sad to think that as someone who through her photography tried to give under-privileged people a voice, she was murdered. Or maybe it was because of what she was doing that that man decided to take her life. Who knows. On a happier note, the sun is shining, birds are singing and weeds are growing so I really must out there and do some gardening!! I must admit I'd never heard of Anja Niedringhaus. Her death is sad and shocking in equal measure. I'd not heard of her either. But when I saw it on the news i looked her up and saw what she'd done with her life and was impressed. She has won a Pulitzer prize, a courage in journalism prize and seems to have been in every major area of conflict in the last 10 years. She photographed many, what we would call 'positive' images of girls and women in Afghanistan.